Economic Electric Company E.E.C. Twickenham. London SW. 1920 - 1933. This is the only example I have seen of this key with all adverts showing the model below, the G.P.O. Pattern. The contact screw appears to be a replacement and one of the terminal nuts does not match so I presume this is also a replacement. Until I can find another image of this hard to find key I cannot confirm the full extent of these replacements. This appears to be made for the amateur market so could date slightly later than the G.P.O. Pattern below. The Economic Electric Company was still active in 1935 with this type of key seen on an advert from 1933. After 1935, no other information has been able to be found so assume that the company ceased trading at that time. Economic Electric Company E.E.C. Twickenham. London SW. 1912 -1918. An advertisement from January 1918 during WW1 shows the cost of this 3 terminal brass GPO Pattern Key in the large size as 11 shillings and 6 pence, approx £40 in today’s money. On this example the knob has been replaced at some time and the owner’s initials of R.F.C. have been stamped at the rear of the base which is 5 ½” x 2 ¾”. A nice key with a light feel. I have been contacted by Peter Smith ZS6FS in South Africa who has pointed out that the R.F.C. could be for the Royal Flying Corp which was the air arm of the British Army and was in existence from 13 April 1912 to 1 April 1918 when it merged with the Royal Naval Air Service to form the R.A.F. British Hand Key G.P.O. Pattern Economic Electric Company E.E.C. Twickenham. London SW. 1912 -1918. Another, as above but with the label mounted in a different position and with the original knob and skirt. British Hand Key for amateur radio by A.W. Gamage of Holborn. London. circ 1920 – 1935. Although not marked, an example of this key is in the Sigma Collection in Uraguay sporting a A. W. Gamages Label so deduct this key is manufactured by Ward and Goldstone Ltd. of Pendleton, Manchester. In the year 1910, department store A.W. Gamage, Holborn began supplying complete wireless telegraphy sets, to supplement their range of component parts which had been introduced in 1908 to enable the amateur to make up his own equipment. The department store of Arthur Walter Gamage (started in 1878) was one of the few concerns catering specially for the amateur experimenter and all their wireless equipment was made for them by Ward & Goldstone Ltd. of Pendleton, Manchester. Because of the piecemeal expansion, his department store ended up as a maze of rooms, steps, passages and ramps which Gamage now called the People's Popular Emporium. Children and adults alike experienced something of an adventure as they wandered through the warren in search of bargains. It offered a very wide selection of goods, including haberdashery, furniture, motorbikes, sporting goods, gardening supplies and utensils, camping equipment and clothing. The premises closed in March 1972. The frontage on Holborn that was Gamages is now occupied by a W H Smith stationery store. This key is actually part of a practice set made by Gamages during the Great War in 1918 as can be seen complete with its buzzer assembly in the image from the late David Wyn Davies Collection. The two parts are detachable from each other allowing them to be used in various combinations with other sets. They can be slotted together by means of the brass inset strip and the two link terminals but the above example is quite usable just as straight key. Although there are no military markings on this key it may well have been used by the military for practice purposes. This Sending Key, Commercial Type is almost identical in design to the Straight Key on the Gamages Practice Set and was produced by Gamages at the same time around 1918. Although there are no military markings on this key, like the practice set, it may well have been used by the military. It is a very robust key with a good solid feel to it and not often seen now. This key, although unmarked, would have been made by A.W. Gamage around the period of 1920-1940. It is a tiny key with the mat black painted plywood base measuring only 3 inches long by 1 ½ inches wide and having four countersunk fixing positions, one in each corner. The brass hardware has straight knurled terminal and adjustment nuts. The knob is identical to that on the key of the Gamage practice sets from 1910 onwards and on this key is complete with protective skirt. The contacts on the base are also the same as other Gamages keys. This hand key, designated PATT.1056.A was manufactured by Walters Electrical of brass and was used by the British Post Office and Telegraph Offices. It has distinctively shaped tall Bakelite knob and turned terminal screws with straight knurled heads unlike any other, which makes this key very recognisable. It is mounted on a polished mahogany base and is nicely balanced. The arm has a casting mark of WE8208 with a replaceable screw in contact and is mounted in a trunnion block by means of a tapered pin secured by a slot headed screw on the top which is typical of British hand keys of this period. British Hand Key by Walters Eectrical Manufacturing Co Ltd (WEMCO) after 1950. This hand key of plated brass construction has a plastic knob rather than Bakelite and differs from G.P.O. Pattern keys of similar design where the trunion block would normally continue on the surface to the central terminal screw, this design has it isolated with the contact being made by a wire on the underside giving this key a cleaner look. The plating apears to be dull Nickel and in this example is in great condition. Although this key carries no manufacturers mark, an example carrying one and identified by the same, can be seen in another collection, that being of Gustavo whose wonderful collection can be found online under SIGNA TELEGRAPH COLLECTION and is based in URUGUAY. Giving its design and construction, dating this key would be after 1950. Above is another example of the Walters Electrical Manufacturing Company Ltd. Hand Key. This is a slightly earlier version and has the makers label so it is evident that on later versions the addition of the label was dropped. This example is in nice overall condition but is missing the adjuster clamp screw, the adjuster is a tight enough fit as to not be a problem in operation. British Hand Key 2/NP Manufactured by Signaling Equipment Ltd of Potters Bar, Middlesex. The following was printed on the box this key was delivered in. Commercial Type Morse Key fitted with nickel silver contacts and sensitive triple adjustment. Precision built and of solid construction. Manufactured by Signalling Equipment Ltd of Potters Bar, Middlesex. 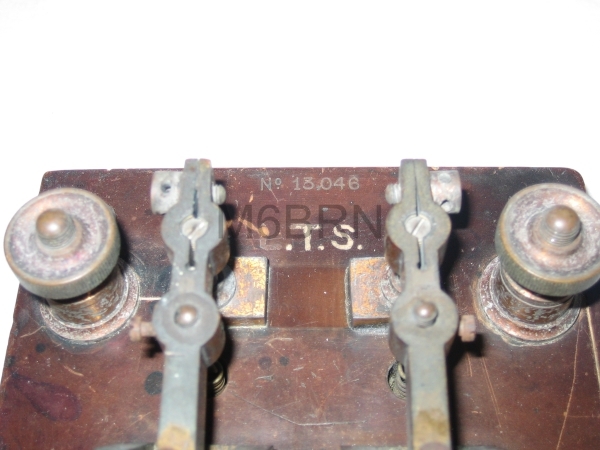 This key, although not having any manufacturer mark is presumed to be made by Signalling Equipment Ltd due to the similarity in design to the 2/NP Commercial Type Morse Key. This version is almost identical although on a short base, the knob is a replacement and not original. manufactured by Ward and Goldstone of Salford circ 1940-60. Ward & Goldstone’s engineering factory was a family firm, founded in 1882 by Meyer Hart Goldstone and James Ward. It produced all manner of cables, plugs and car parts (to name just a few examples of its output), many of which it supplied to Woolworth’s. It was once Salford’s largest industrial employer. In its later years, the company was run with a patrician hand by the Goldstone family, particularly Sampson Goldstone or ‘Mr Sam’ as he was known by many employees (although opinion varies on how he dealt with unions and strikes. Ward & Goldstone’s lasted until 1986. 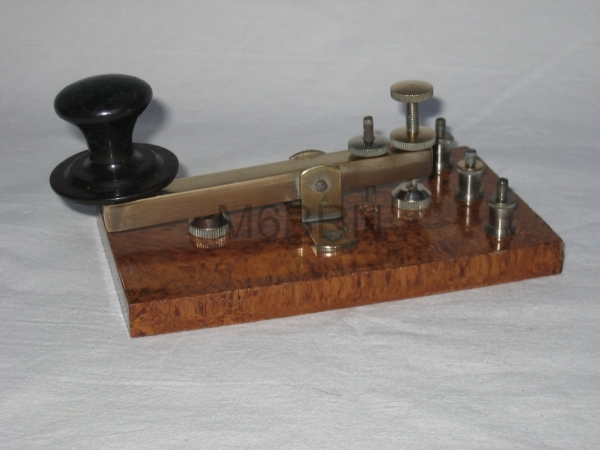 In the early years one of the company’s brands was ‘Goltone’ producing crystal radios and components including this radio key on a Bakelite burr walnut effect base, quite impressive for the day? The contact blocks are very similar in design to that of the 2/NP key produced by Signaling Equipment Ltd of Potters Bar during the war years so this key is presumed to be of this period. British G.P.O. Pattern Hand Key Manufactured by Ward and Goldstone of Salford circ 1920-40. This is a G.P.O. Pattern hand key by Ward & Goldstone of Pendleton, Salford. Manchester. It was manufactured between 1920 and 1940 and is of the classic G.P.O. Pattern. Although this is the case, it was probably manufactured for home radio use rather than for professional purposes. It has contacts which are purely the tips of screws rather than silver tipped replaceable ones. The pivot block is of a riveted form with the parallel pivot pin a rather loose fit through the thin brass ears of the folded brass. The arm is of cast brass with the minimum of machining required. This example is complete apart from a missing break terminal screw thumb nut. Generally is would be a good key for the home user and is surprisingly nice to use although the spring is quite heavy, even on its lightest setting so would have got tiring over long periods of use. Ward & Goldstone’s engineering factory was a family firm, founded in 1882 by Meyer Hart Goldstone and James Ward. It produced all manner of cables, plugs and car parts (to name just a few examples of its output), many of which it supplied to Woolworth’s, as well as a large number of Morse Keys both for military and civilian use. It was once Salford’s largest industrial employer. In its later years, the company was run with a patrician hand by the Goldstone family, particularly Sampson Goldstone or ‘Mr Sam’ as he was known by many employees (although opinion varies on how he dealt with unions and strikes. Ward & Goldstone’s lasted until 1986. British Hand Key by DULCI of London. 1947 – 1959. The DULCI Co Ltd was situated at the DULCI Works, Tower Road, Pound Lane, Willesden, London in 1947. In 1953 & 58 they were at 97 – 99 Villiers Road, London NW2. They were manufacturers of Radios, Amplifiers, Tape recorders, Band 3 converters and Tuner chassis. 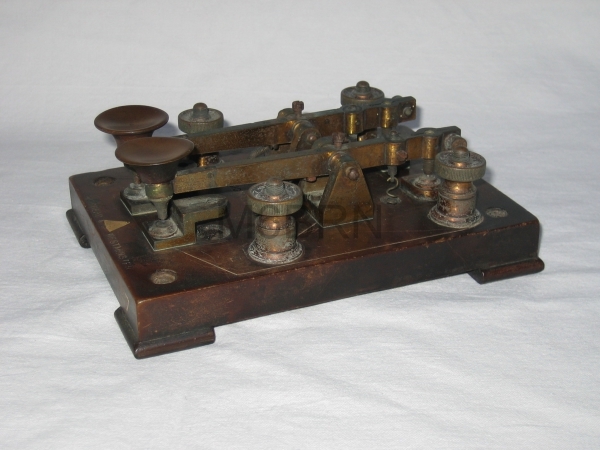 They also made Morse keys for the amateur radio market. In 1959 the company was taken over by Lee Products (Great Britain) Ltd. Lee Products used the ‘ELPICO’ brand. British Morse Key Professional Type Model Mk 2. by The DULCI Company of London. circ 1947 - 59. 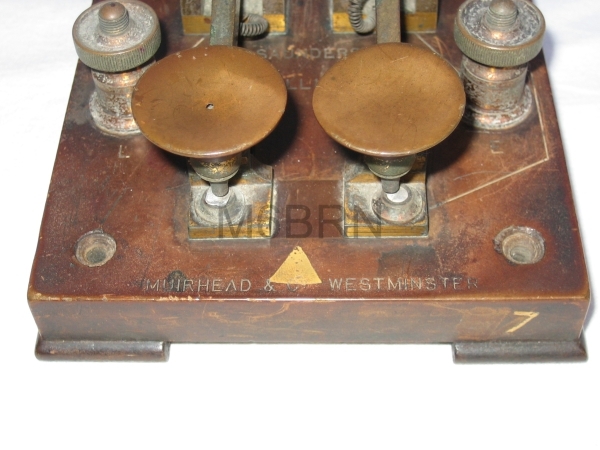 Mark 2 model of a Professional-type Morse key. Genuine nickel-silver contacts and three individual sensitivity adjustments. This item has never been used and still wrapped in the original tissue and box. This example is New Old Stock complete with its box and packing tissue paper although the corner of the box seems to have been converted into mouse bedding. In the early 1970s a business was acquired called Johnson's Radio, which specialised in VHF shortwave and VHF construction kits, and used the brand name Globe-King. This is part of the stock that was acquired and the first time it has ever been opened was to take the photos of it and its contents. It has a black crackle finish and underneath is marked PL36/234 number 10. Model 3 Morse Key manufactured by Norman Rose (Electrical) Ltd. circ 1937. This is an early example of the advertised model 3 hand key of simplified construction manufactured by Norman Rose (electrical) Ltd. 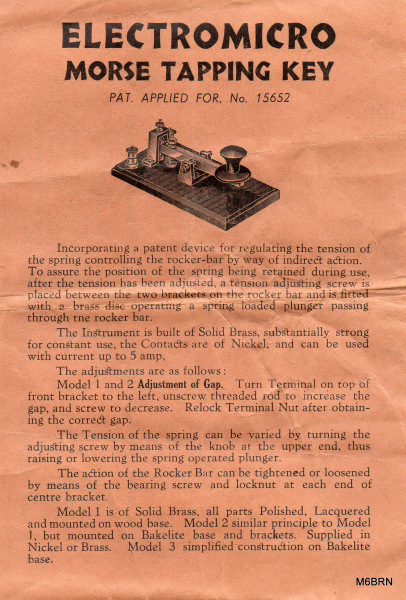 Unlike the keys below, this was obviously manufactured before the implementation of the modified spring tension adjuster so would date this at circ 1937. It is of brass construction mounted on a timber base with the manufacturers label clearly on the underside. This key was obtained from Brian Poole G4UJL in August 2018, thanks Bri. a subsiduary of Norman Rose (Electrical) Ltd. This example which is complete with box and instructions was priced at 7 shillings and 6 pence or 37.5 pence in todays money as can be seen on the label to the left. On researching Norman Rose with Companies House it records that it was incorporated on 24 July 1947 with its address in Gladstone House, 77 - 79 High Street, Egham. Surrey and subsequently dessolved in 22 Oct 2010. but I have a copy of The Wireless World magazine dated Friday 1st Oct 1937 with an anouncement stating that Norman Rose (Electrical) Ltd had moved to "Waveband House", 43 Lambs Condit Street. London. C.W.1. as printed on the label to the left. I presume from this that Norman Rose based in "Waveband House" was incorporated before Oct 1937 and liqidated before July 1947 and the name was reincorporated by new owners then. This would then date this key to between 1937 and 1947. The above example is model 3 of simplified construction but on a wood base and in Nickel. Electromicro Morse Key manufactured by Norman Radio Products Model 1. As seen on the above label, this key was retailed by S. Stern, a radio and electrical engineer with shops in Fleet Street, London E.C.4., and 12 Camberwell Rd, S.E.5. The telephone number format on the label dates this between 1922 and 1966. The above example is Model 1 in polished brass on wood base and appears to have had replacement terminal screw nuts and is dated between 1937 and 1947. 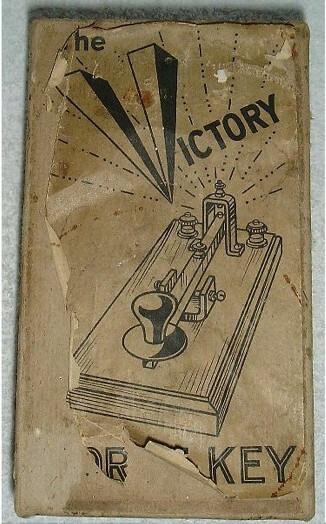 The “Norden” Morse Key by S. J. Mitchell, Blackburn. Circ 1900 – 1922. This British hand key is made of brass and mounted on a timber base. The base bears the stamp of S. J. Mitchell, Blackburn, in a circle and “Norden” on the opposite side which is the trademark of Mitchell & Kenyon who were in business between 1897 and 1922 and dates this key nicely during this period. This key is original apart from the knob which is a replacement. Sagar Jones Mitchell was born on 28 October 1866 and died on 2 October 1952. He was a pioneer of cinematography in Blackburn, Lancashire, England. The son of John and Eliza Mitchell, he was educated at a private academy and apprenticed as a cabinet maker. In 1887 Sagar and his father John founded the firm of S. & J. Mitchell, a photographic apparatus manufacturing and dealing business. Sagar was associated in partnership with James Kenyon since 1897. Mitchell & Kenyon were early film makers and manufacturers of cinematograph equipment. The success of their early films encouraged Mitchell to give up his shop and in September 1901 Mitchell and Kenyon moved into premises in Clayton Street, Blackburn, to concentrate on film production. Mitchell and Kenyon used the trade name of “Norden”, the company became one of the largest film producers in the United Kingdom in the 1900s, producing a mixture of topical films of street scenes, sporting events, rides through towns on the top of trams, and ordinary life, which were extremely popular as people loved to see moving pictures of themselves), fiction, and fake war films. Many of these films were produced for travelling showmen. Mitchell was a manufacturer of cameras and photographic equipment, this side of the business continued after the merger in some form, possibly as retailers. Kenyon was a manufacturer of automatic machines (i.e. penny-in-the-slot apparatus), this side of the business was still listed in 1920. In May 1907 Sagar Mitchell resumed possession of his original business S. & J. Mitchell, at 40 Northgate, Blackburn. The volume of film production seems to have tailed off from this date, and from 1909 was increasingly restricted to local events. Mitchell was joined in his business by his son John in 1921 and his partnership with Kenyon was formally dissolved around 1922, Kenyon died in 1925. Sagar lived to the age of 85, and died on 2 October 1952. John continued to run the business until he retired in 1960. British Hand Key by A. Franks Ltd. Manchester. Circ 1920 -1940. This hand key was manufactured by A. Franks Ltd. Manufacturing Optician from Deansgate, Manchester who was established in 1798. It is recognisable by the position of the front contact on the arm being directly under the knob unlike most hand keys where the contact is positioned further back towards the pivot block also the turned brass contact pillars. It is a Make and Break key having three terminal posts along the back edge of the light varnished timber base. This key was shown on the front page of Morsum Magnificat No50 dated February 1997 with that example being from the collection of Wyn Davies. This is a good example which is complete and original and although it has no manufacturers marking or label it is clearly identifiable. Another example of this key has been seen with a stamping of G.E.C. made in England so I would imagine that it was re-labelled for use within the G.E.C Group. British Hand Key by W.G.Pye & Co. Cambridge. 1896 - 1946. 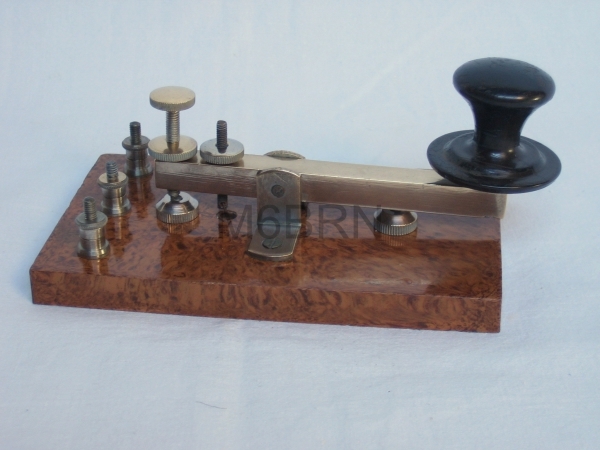 This scarce key is of great quality, manufactured of brass on a Bakelite base by W.G. Pye of Cambridge. It carries the markings of Honours Lab and a serial number of E.K. 107. I have seen 2 other examples of this key, one in the collection of John Snell G0RDO at Morsemad.com but does not carry any other markings apart from the PYE stamp. The other also carries the Honours Lab stamp but carries the number of E.K. 105, maybe they sat on adjoining benches, who knows! From 1896 the initial Pye company was known as W. G. Pye & Co and in 1925 formed a radio division called Pye Radio Ltd. In 1929 Pye Radio Ltd was purchased by C. O. Stanley and became an independant company. In 1937 Pye Radio Ltd changed its name to Pye Limited and the Company continued to use this name until 1960. W. G. Pye & Co continued with the scientific instrument business until 1946 when it was bought by Pye Ltd.
manufactured by C. F. Palmer, Ltd circ 1950. This well made key, which was manufactured probably around 1950, adds to the few known to be made by this elusive manufacturer. It is manufactured of nickel plated brass on an ebonite base. It has 5 terminals although the shorting switch contacts are not hard wired to the three main contacts, which is strange, so this may have been used as an on/off switch for either batteries or other parts of the radio setup. It has a fixed spring so tension cannot be adjusted so could make this a key tiring to use for long periods. C. F. Palmer, Ltd was founded in London in 1891 by the English mechanical engineer and bicycle maker Charles Fielding Palmer (1864-1938). It described itself as making "Research and Students' Apparatus for Physiology, Pharmacology, Psychology, Bacteriology, Phonetics, Botany, etc." It specialized, however, in equipment for the relatively young science of physiology. From the 1930s onward, the company catalogue also mentioned equipment for research in psychometrics and as a result of good workmanship and excellent contacts with scientists. The company became an important supplier of physiology research equipment in the British Empire until about 1950. At some time the company was floated and became C.F. Palmer Ltd but by the 1960s and 1970s it stuck to mostly electromechanical devices in an increasingly electronic age and it lost some of its importance as an instrument maker. It was renamed Palmer Bioscience and in 1987 it was acquired by Harvard Apparatus. Latching key Patt. 5038 – Gambrell Bros & Co Ltd circ 1930. 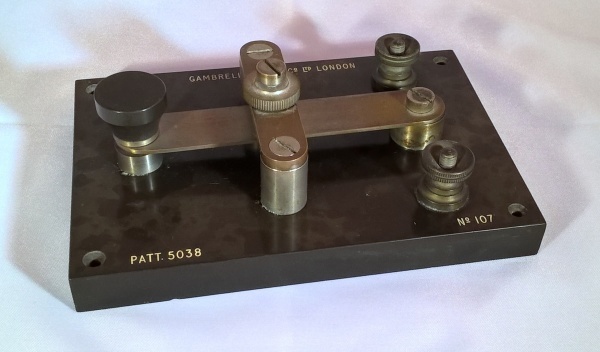 This is an example of a Latching Key Patt.5038 s/n 107, manufactured by Gambrell Bros & Co Ltd around the period 1930. It was probably manufactured for use in a teaching environment rather than an industrial or communication environment. The base is of Vulcanite with nickel plated fittings. The arm, when in its rest position and un-latched, is in the make position by means of the contacts on the top surface of the arm and the adjusting contact on the bridge and can be latched down, breaking the contact. On the underside of the base are four small threaded holes indicating that at one time there was probably a cover plate protecting the fittings from shorting. British Hand Key by R.A. Kent Engineering 1983 to Present. R A Kent Engineering was founded in 1965 by the late Robert A Kent. The present owner, Robert S Kent, son of R A Kent, joined the firm in 1971, and took over the management of the firm in 1988. The company was originally based in Banks, Southport, but moved to purpose built premises in Tarleton, Preston, in 1982. They were mainly a general precision engineering firm until 1983, when they started the design and production of Morse code keys. Over the following five years, the Morse key manufacture virtually took over the business, and the mainstay of the business today is still the design and manufacture of Morse code keys. They have always been a family run business, with various members of the family, including the two sons of the present owner, taking an active part in the business. Classic G.P.O. Hand Key by Elliot Brothers (London) Limited. Circ 1920. Around 1850 William Elliott took his two sons, from his third marriage, Frederick Henry and Charles Alfred into the business and began trading as William Elliott and Sons. At the Great Exhibition of 1851 the company was awarded a Bronze Medal. William died in 1853 and in his will he left his share in the partnership to provide his wife, Emma, with an annuity. Frederick and Charles obtained patents for improvements in drawing boards, barometers, and telescopes. The company prospered, its success attributed to Frederick's business ability. Before long the Company was producing most of the standard optical, surveying, navigational and "philosophical" instruments for home and overseas customers. By 1854 his two sons were trading as Elliott Bros and in 1857 they took over the firm of Watkins Hill. The company worked willingly with academics and others to realize their inventions; instruments for the new applications of electricity were produced and became an important part of the firm's activity. Customers included J. C. Maxwell, Charles Wheatstone, Lord Rayleigh and other leading scientists. Products from these years include galvanometers and batteries. In 1865 Charles Elliott retired and he died in 1877. Frederick continued to run the business as sole proprietor and on his death in 1873 he left the business to his wife Susan. In 1876 a new works was established in St Martins Lane London to supply the growing demand for telegraph equipment. Orders from the Admiralty continued for ships directors and torpedo directors. The rapidly expanding electric lighting industry saw much new business and products expanded to cover complete switchboards for lighting, traction and power for tramways. This business continued for many years but there was also growth in the field of measuring instruments and accessories. In 1881 the company won a Gold medal for instruments of precision at the Electrical Exhibition in Paris and indeed won nine medals at various international exhibitions.. Susan Elliott took Willoughby Smith, famous telegraph engineer, as business partner thus paving way for Elliotts to become the leading telegraph instrument company, as recorded in contemporary writings.Mrs Susan Elliott died on 25th March 1880 which severed finally the name of Elliott with the company they founded. After almost one hundred years in Central London the business had grown too large and in 1898 Elliott Bros took steps to move their manufacturing to a new green-field site at Lewisham in Kent. ‘Century Works’ was occupied in 1900, by which time there were some three hundred employees producing high-quality instruments for navigation, surveying, calculating, telegraphy, optics, mechanical and electrical engineering. This hand key manufactured by Ivory Electric Ltd., 45 Grafton Way, London W1 around 1950 is complete with what remains of the original packaging although this has had a hard life. Written on the box in pencil is the initials W.B. and in the top left hand corner W. Bayl who I can only guess was the original owner. The design of this key is similar to other examples from the same period namely from Signalling Equipment Ltd. 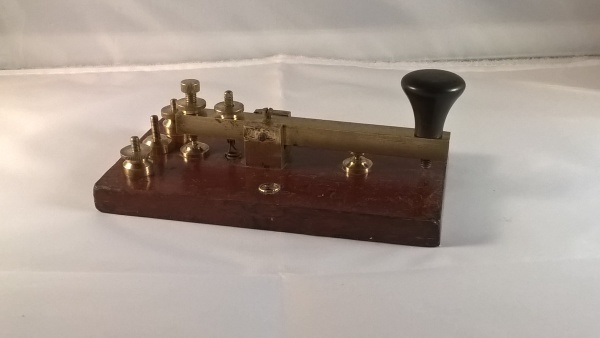 This is the first example of a standard transmitting key on a wood base I have seen as opposed to the Morse Code Practice Oscillator on a plastic base that are more commonly seen. This British hand key is manufactured by Philip Harris Ltd. from brass and mounted on an Ebonite base which measures 4 ½” x 3 3/8”. It is stamped on the top face of the arm P.H.Ltd. and dates from circ 1930. It is a nicely made key, complete with original knob and skirt which, like the rest of the key, has great patina. Philip Harris Ltd was a British laboratory supply company (part of Philip Harris plc) which became a major supplier of equipment for school science. The brand name is now owned by Findel plc. The company was originally based in Digbeth, Birmingham, and was started by Thomas Ellis, a surgeon, in 1817. At the time Philip Harris would have been only 15 or 16 years old; he joined Ellis in 1825. The company traded as a wholesale Chemical Laboratory Company, occupying a site in the Bull Ring until 1889 (when according to their Catalogue of chemical and physical apparatus and chemicals, dated 1889, silver nitrate was selling for 9 shillings per ounce). They moved to 144–146 Edmund Street at some time around the turn of the 20th century. This British three terminal hand key was manufactured around 1925 by W.B. McCallum, an optician from Perth in Scotland. It still carries the label on the base giving his address as 8 Scott Street Next to G.P.O. Perth, Scotland with a telephone number of 326. William McCallum was at this premises in 1911 and also in the late 1930’s but by this time he was a registered limited company specialising in Developing and Printing, Enlarging, Making Lantern Slides and Copying. He is also advertised as doing everything Optical, Kodak and Radio and had also enlarged his business to include 10 Scott Street as well. Given that the label on this key has him only at 8 Scott Street and not limited would date it at circ. 1925. The key itself is well made with brass fittings mounted on a light oak base, it has a round slotted trunnion with the arm pivoting on a brass pin. It has 3 terminal posts with straight knurled terminal screws and a black painted wooden knob with skirt. It has a gap adjusting stud with lock nut and a spring tension adjuster. 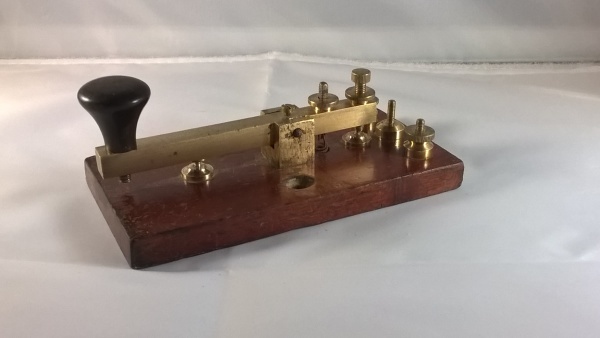 This British hand radio key was manufactured by Raymart Craft a Creed of 48 Holloway Head. Birmingham 1 in 1942. It has a brass lever and terminal screws with a brass strip connecting the make contact and the terminal screw with a 3/8” diameter silver tipped contacts and is all mounted on a black painted cast base. 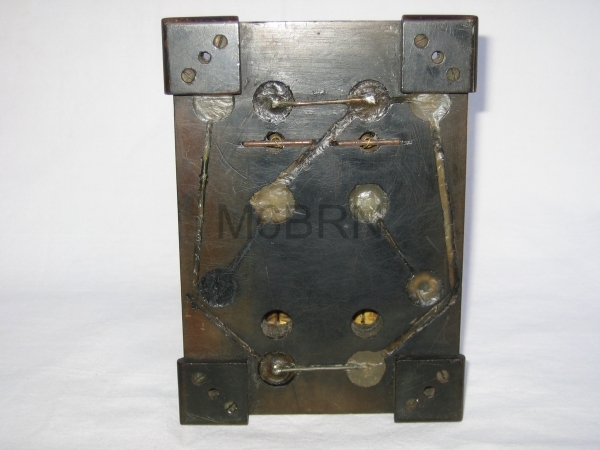 The base is cast from pot metal and is non magnetic and bears the cast mark of APDP in a circle which is in a recess directly under the stop screw. One identifying part of this key is that the stop screw rests on a raised pillar of the cast base. Usually this key would carry a transfer around the front edge of the base in red, gold and black with the manufacturers name but unfortunately on this example it has worn off. British G.P.O. Pattern Hand Key by either Elliott Brothers or Telegraph Works, Silvertown. London. circ 1915. This beautiful G.P.O. Pattern hand key is presumed to be manufactured by Elliott Brothers or Telegraph Works, Silvertown, London. around 1915. It is identified as such by the deeply recessed terminal thumb nuts although there is no manufacturers mark or date stamped on the tapped brass plate as is usual with keys of this design and age. Other examples I have seen have been marked Silvertown and A.T.M. and stamped with a date of 1915 and 1916 so would date this key within that period. British G.P.O. Pattern Hand Key by E&OA Co Ltd No 138 circ 1915. This beautiful hand key was manufactured by The Electric & Ordnance Accessories Company Ltd. (E&OA Co Ltd) around 1915. It is on a small base footprint of only 4 ½” x 2” and is of identical pattern to the example below. It has an elliptical brass label marked E&OA Co Ltd and a serial number of 138. Although there have been other examples of this key that has been found with labels marked CONSOL TELE CO. The key itself including the knob are of a standard G.P.O. pattern. The Electric & Ordnance Accessories Company Ltd. (E&OA Co Ltd). Was formed on 29th August 1901 by Vickers, Sons and Maxim to carry on special branches of that Company's work. In 1908 they were operating from the Stellite Works, Cheston Road, Aston, Birmingham but in 1914 they constructed a large factory between Common Lane and Drews Lane in the Ward End area of Washwood Heath. The Ward End Works covered an area of 65 acres upon completion. During WWI the factory produced munitions fuses and shell cases for soldiers fighting in mainland Europe. Post-war, Vickers, the owners of Electric & Ordnance Accessories Company Ltd., put the factory under the ownership of Wolseley Motors on September 30, 1919. After the change in ownership, Wolseley replaced the small workshop sheds with a large assembly building. In 1920 a new company was formed under the style and title of British Timken, Ltd., the new company was formed to take over the manufacture of the well known Timken roller bearings in Britain, formerly carried on by the Electric and Ordnance Accessories Co. Ltd.
British G.P.O. Pattern Hand Key by Elliott Brothers or Telegraph Works circ 1915. This beautiful hand key is presumed to be manufactured by Elliott Brothers of London or Telegraph Works, Silvertown, London. Around 1915. It is on a small base footprint of only 4 ½” x 2 1/8”. It is identified by the deeply recessed terminal thumb nuts and the witness of the screw on label on the front edge of the base. Other examples of this key have been found with an elliptical brass labels marked CONSOL TELE CO and E&OA Co Ltd. This key has a witness of a rectangular label identical to those fitted to Elliott Bros instruments so may have been manufactured by them. The key itself including the knob are of a standard G.P.O. pattern. British G.P.O. Pattern Hand Key circ 1915. This G.P.O. Pattern hand key has no manufacturers mark but is well made. These keys were produced by many companies around this period and have a great feel about them. This one however is unique by having the trunnion block made in two parts, each part having a turned location between them, this allows the contact point to be accurately lined up before being tightened to the base. The brass furniture is mounted on a mahogany base with a boxwood rail surrounding the underside. Manufactured by Muirhead & Co Ltd. No. 110805. Ebonite sub base (130 x 95mm) on wooden (Teak) base (140 x 104mm). Muirhead & Co Ltd. No.110805. Label on centre front of wooden base. This key has all brass fittings with Bakelite knob. There is a switch with Bakelite knob marked SEND and RECEIVE mounted on the top face. Two terminal screws at back with Bakelite straight knurled heads, which may be replacements, and two terminal screws with slotted brass heads mounted either side on the top face. Used for repeaters and double current working. A Double Current G.P.O. pattern Key by H. White & Co. 1918.No 5039. 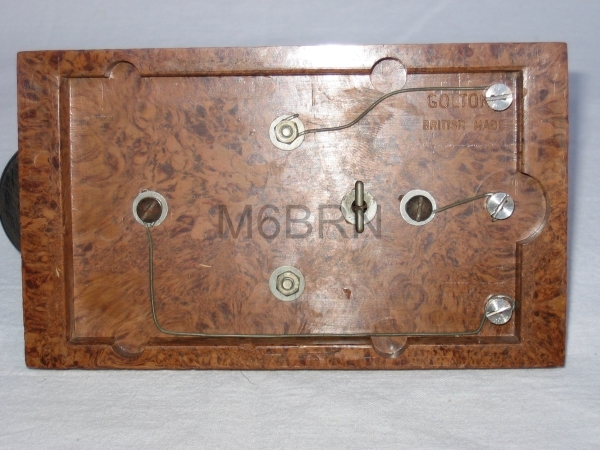 This five (5) terminal Double Current Post Office pattern Mk 3 version key with solid cover and milled terminals was made by H.White & Co. in 1918. Due to the lack of military broad arrow markings it is deducted that this key was made for civilian use. This Double Current Keys is provided with a switch which joins up the relay for the reception of signals when at “receive”, and when turned to “send” connects the battery between the up and down line terminals in a direction dependent upon whether the key is at rest (spacing current) or depressed (marking current). The key consists of a divided lever playing between four contact springs. 1. The discharge of the line is hastened. 2. The relay is worked in its most sensitive condition, i.e., neutral. 3. The effects of residual magnetism in the cores of the receiving relay are reduced. 4. The effects of a variation of received current are reduced, since both marking and spacing current are equally affected and the instrument is therefore self-adjusting. Australian P.M.G. straight key circ. 1915. This is an example of the famous Australian P.M.G. (Post Master General’s Department) key, 3 terminals without circuit closer. Originally these keys were manufactured of all brass fittings on a wooden base and gutta-percha knob, gutta-percha refers to the trees the timber came from that being mainly the palaquium gutta. It wasn’t until the 1930’s that manufacture changed to incorporate Bakelite bases and knobs with the fittings made from steel. Both 2 and 3 terminal versions were made with or without circuit closers. Those with circuit closer for closed circuit work and without for open circuit work. They were manufactured by the Post Master General’s Department workshops and were very robust and extremely well made. This example would date from between 1900 and 1930 and is in good overall condition. More examples of these great keys can be found on Ron McMullen’s website on Australian Telegraph Instruments, a link can be found on my links page and where the above information was sourced. Australian Levenson No2 P.M.G. Type key circ. 1940. This is an example of Levenson’s No2 key, described as a P.M.G. Type, with heavily plated fittings on a thick wood base measuring 4 ¾” x 3” x 7/8” strong and reliable with perfect action. In a catalogue dated 1941 it was priced at 19/6, or nineteen shillings and sixpence in old money. Levenson’s was a well known radio shop located at 226 Pitt Street, Sydney and was active between the 1930’s to 1950’s. They sold a number of products including 3 models of straight keys with this example being the No2. They also sold a range of “Like-A-Flash” Morse keys and sets which included a semi automatic bug key which in all respects was a Buzza Products Double Lever Semi Automatic Bug, re-labelled and marketed through Levenson’s shop. The bottom image shows this key alongside a Levenson P.M.G. Type Sounder that was advertised at the same time in 1941 and originally could have been purchased as a set as I myself obtained both from the same seller. More examples of these great keys can be found on Ron McMullen’s website on Australian Telegraph Instruments, a link can be found on my links page. The above information was sourced from an article in MM 89 written by Ron and also from his website. British Hand Spark Key circ 1920. 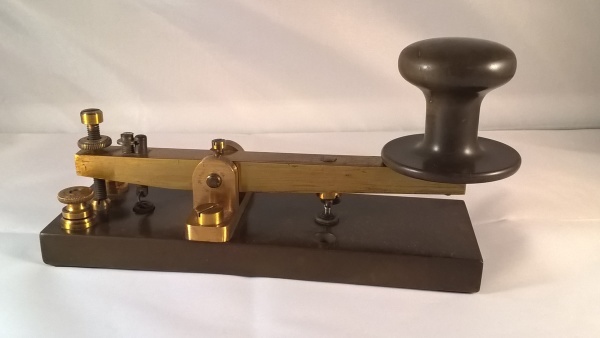 This large key with ¼” contacts and with a base measuring 6” x 3 ½” was designed for heavy spark transmitter use. It appears to have these large contacts fitted from a large Marconi key based on their design. Although I have categorised this key as a civilian key it could also have been a military key but with no markings is open for debate. British Hand Key with UIC logo circ 1930. This British hand key is nickel plated brass and has 1/8” dia. contacts. It has an ebonite base of only 4” x 2 5/8” which is mounted on a light mahogany base. The fittings have B.A. threads which confirm it as a British key with the terminal screws being retained by small screws. It has a logo on the top face that being UIC which has certainly caused some head scratching. The only reference I have found is for either the University of Illinois, Chicago U.S.A. or that of the International Union of Railways which given that it is British tends to lean it towards the railways but I am not over convinced as the logo doesn’t seem to match that of the union even going back to the 30’s so further research is needed to confirm. This British hand key manufactured from brass and mounted on a thin Ebonite base with an estimated manufacture date of between 1920 and 1950. It is in good overall condition with nice patina, it is well manufactured although my thoughts are that it is made either by a very competent machinist or maybe from kit or plan form. On the underside of the base are witness of marking out lines which I suspect that if it was a commercially made key would not be there. Also there are no fixing holes in the base so was not designed to be fixed but the base is quite thin and has non slip felt strips bonded to the underside to prevent it moving on the table. It has B.A. threads which confirms its British origin and is very smooth and easy to use with a nice feel but to date I have not seen another example. Any help identifying this key would be gratefully appreciated. This British made hand key is named ‘The Victory Morse Key’ and would date from after the Great War 1914-18 so around the 1920’s. It is designed with the contact and adjustment on an overhead rear mounted bracket. It is manufactured in brass on a boxwood base and has a nice light feel. The image of the front face of the box is from the wonderful collection of keys by Doug K4KEY and his site www.telegraphkeys.com where he has another example of this key, a link to his site can be found on my favourite links page. This British hand key, manufactured from brass and mounted on a black painted timber base, has an estimated manufacture date of between 1930 and 1950. It is in good overall condition although the knob appears to be a replacement. It has an unusual designed pivot block which is mounted fore and aft rather than side to side and works well. There are no visible makers marks and to date I have not seen another example. British Hand Key of unknown origin but probably British GPO. British Hand Key of unknown origin. This key of brass on a timber base plate is itself mounted on a cast iron base which gives it good weight and apears to be as supplied. Apart from the two brass securing screws, there are two screw heads that are painted in the same finish as the base itself tends to back this up. It has a good feel and is well made although the knob and spark guard are plastic and not bakelite so may be replacements. This unusual British hand key seems to have been made by an amateur in the 1930's and was obtained with an early battery charger designed to be plugged into the light fitting as many early mains powered equipment of the day. British Railway Signal Box Hand Key. This nice brass hand key was used by British Railway Companies in their signal boxes to transmit messages between signal boxes. The railway block signaling bell code is a system of bell rings used in Great Britain to communicate between manually operated Signal Boxes (the system is not used in modern power signal boxes). Each signal box would have a bell circuit to the box on either side of it along the line. The equipment would consist of a plunger or tapper (rather like a Morse key) which if pressed, rings the bell in the neighboring box. The neighboring box would have a key for communicating back; therefore each box has a key which rings the bell in the other box. Where a signal box communicates with more than one other box (in either direction along the line, and possibly along a branch line too), each bell would have a different tone, so that the signalman could tell them apart by ear. British Hand Key circ 1920 – 1945 - Manufacturer Unknown. This British hand key is manufactured from brass and mounted on a polished timber base. It has three terminals giving it a “make and break” facility but is very light with no spring tension adjustment; contact spacing can be adjusted by means of the rest post. The pivot fulcrum post is mounted on a large circular brass flange and has a tapered steel pin connecting the thin sectioned arm. All threads have been checked and appear to be of B.A. form confirming its British origins. My thought is that this was a practice or training key but I am open to suggestions. Any help identifying or being able to supply more information on this key would be gratefully appreciated. British Hand Key circ 1920 – 1945 - Unknown Manufacturer. This British hand key is manufactured from brass and mounted on a polished timber base. The pivot block is mounted longitudinally and set on a block of insulating material. Although there are no manufacturer’s markings indicating who or where it was built, it is an extremely well made key. This “Make and Break” Key with 3 terminal screws, has an adjustable make contact as well as adjustable spacing screw, both locked off by a knurled thumb nut, all together a very nice key. This British two terminal hand key, like the three terminal version, is manufactured from brass and mounted on a polished timber base. The trunnion block is also mounted longitudinally and set on a block of insulating material. Although there are no obvious manufacturer’s markings indicating who built these keys, both are obviously manufactured by the same maker. There is one identifying mark on this particular key, that being the arrow head mark on the knob which might indicate a potential manufacturer. Any help identifying the manufacturer of this key would be gratefully appreciated. This British hand key, manufactured from chrome plated brass and mounted on a stained and polished timber base, has an estimated manufacture date of between 1940 and 1950. It is in good overall condition and all original. It is very similar to an “Ivalek” hand key, although the pivot block seems over high for the purpose and could have benefited from being machined down but this, I imagine, would have increased production costs so was left as stock size. There are no visible maker’s mark but was probably made for the amateur radio market. Any help with more information about this key would be gratefully appreciated. This British hand key is manufactured from nickel plated brass and mounted on a polished timber base and has an estimated manufacture date of between 1930 and 1950. It is in good overall condition although the knob appears to have been repaired at some time and had a new coat of paint on the top surface. It has a fixed spring tension and a rather cheaply pressed and folded trunnion block with a parallel pin and spacer sleeves. Despite this, it actually has quite a good positive feel about it and my guess is that it was made for the amateur radio market. It obviously was a commercially produced key as there is evidence of where a fixed label would have been mounted on the base. There are no visible makers marks and to date I have not seen another example. Small British Key circ 1920 – 1940 – Unknown manufacturer. This small key is mounted on a teak base plate measuring only 3 3/8” long x 2 1/8” wide with two centrally positioned countersunk fixing positions. It is manufactured of brass by an unknown manufacturer. The treads are all of B.A. form, confirming its British origin, having slotted terminal screws with a straight knurled gap adjusting screw. The fulcrum pin is a countersunk headed shoulder screw with the knob manufactured of a tuned hardwood. Any further information on this key would be gratefully appreciated. This British three terminal hand key is manufactured from brass and mounted on a polished timber base. There are no obvious manufacturer’s markings indicating who built this key. One terminal nut is missing and one is not original and it would indicate, from the length of the thread of the knob, that there was once a circular skirt between the knob and arm. British Hand Key circ 1910 – 1930 - Manufacturer Unknown. This British hand key is manufactured from lacquered brass and mounted on a long narrow Vulcanite rubber base measuring 6 ¼” x 2 ¼”. It has two terminals, screw in adjustable contacts and an extremely oversized knob and skirt which is constructed from a solid. It has a parallel pivot pin with two shim washers between the arm and fulcrum block giving it a very precise movement with no side on play. Although this key looks very heavy, it is remarkably well balanced with a light feel. It is of classic English design with a straight arm and rear spring adjuster. Any help identifying the manufacturer of this key or being able to supply any more information would be gratefully appreciated. This is a Morse Code Practice Oscillator manufactured by Ivory Electric Ltd in the 1950’s. It is powered by an Ever Ready No 1289. 4.5volt Battery as indicated on the top face. Ivory Electric also made IVALEK crystal radio sets, IVALEK Wireless Crystal & Cats Whisker and Headphones intended for amateur crystal set constructors. These were aimed at the teenage market and cost 14s 6d. This tiny pracice key and buzzer was probably made for the toy market due to it's size and inexpensive key. The Bakelite base is in good condition with no chips or cracks. Below the mounted buzzer is a table indicating the Morse Code with Goltone to the right and Made in England just underneath the key. The pound coin in the image opposite gives an indication of size. The Kay Sports Co., Dept. M.M13, Pembroke Works, London. N.10, were active from the late 1930's until the 1960's. They made sporting goods including dartboards but also a selection of electrical items in the 1930's including the dynamo and the larger dynamotor. The No.1 dynamo and No.3 dynamotor were designed to run off steam engines as well as a battery or petrol engine. A 1933 advert from The Meccano Magazine shows the Kay dynamo, induction coil and a motor, obviously targeting the successful growing Meccano market of the time. This is the Kay Tapper-Flash Set, an inexpensive twin station Morse transmission and light flash toy for the young boy of the 1930’s. It is in great condition and comes complete with box and instructions. There is evidence that Signalling Equipment of Potters Bar bought out The Kay Sports Co. due to the design of some of Signalling Equipment products being identical to that of The Kay Sports Co. Established in the 1920s, Lafayette Radio Electronics (LRE) became a thriving mail-order catalog business; the electronic components it sold were useful to amateur radio operators and electronic hobbyists in areas where such components were unavailable in local retail outlets. Lafayette's main competitors were Radio Shack, Allied Radio, Heathkit, and "mom and pop" (independent) radio dealers throughout the United States. Early Lafayette Radio stores were located in Jamaica, N.Y. and Manhattan in the mid-1950s. The electronics kits were produced in the Jamaica facility. Lafayette advertised heavily in major U.S. consumer electronics magazines of the 1960s and 1970s, particularly Audio, High Fidelity, Popular Electronics, Popular Mechanics, and Stereo Review. The company offered a free 400-page catalogue filled with descriptions of vast quantities of electronic gear, including microphones, speakers, tape recorders, and other components. This example is in almost ‘as new’ condition and is complete with connection wires, earth lead, ear piece, box and even the cover sleeve for the box and looks as though it has never been used. This set consisted of a key, battery, and buzzer. It was used for training potential radio operators in the Morse code. It was manufactured by Blue Point in the 1950's. Historian Herman Willemsen has provided the following information about Blue Point. The company was founded in the Sydney Australia suburb of Erksville in 1936 by a German immigrant, Frederick Boyd Dirks who named his company F. Dirks. The company produced Bakelite products such as ashtrays, single strip heaters, and Morse key components. In 1946, the company name was changed to Blue Point products P/L. The name was inspired by the name "Blau Punkt", a German electrical supplier. In 1973, the company was purchased by Gerard Industries P/L which was known for its line of Clipsal products. Blue Point keys were identified by the words Blue and Point with a blue dot between them. This example has no Blue Point markings but is embossed on the underside of the base XX20A. There are other models like the model XX20 which is the key on its own, the model XX20A which is mounted on a base and with buzzer and the XX20B which is mounted with buzzer, light and changeover switch. There is also a model X10B which is similar to the XX20B but is a less expensive version with fixed spring tension. In the year 1910, department store A.W. Gamage, Holborn began supplying complete wireless telegraphy sets, to supplement their range of component parts which had been introduced in 1908 to enable the amateur to make up his own equipment. This great practice set is housed in a beautiful timber case. It consists of a key which can be switched to operate either a buzzer or a lamp of which the clear lens is mounted on the side to allow signalling without wires, although it could be paired to another set by wires via the terminal nuts on the top face. The base has a sliding panel which gives access to the battery. These sets were advertised by Gamages as 1916 improved model in use for training Naval and Military Signallers and priced at 16/6. This advert confirms the timescale when these great practice sets were available. Thanks also to Keith G3YZZ for bringing this advert to my attention. This example is in great condition and works perfectly. This practice set was sold through A.W.Gamage around 1920 and is housed in a beautiful timber case. Like the full set which has a buzzer and lamp, this small set has only the buzzer. It consists of a key which operates a buzzer although it could be paired to another set by wires via the terminal nuts on the top face. The base has an open base and the battery is connected through terminals on the top face, the central black one being the battery negative. This example is in great condition and works perfectly. This is the only one of this version I have ever seen and seems a much scarcer version than the full set with the lamp. British “Musonic” Morse Practice Set Circ 1940. This practice set is thought to be manufactured during the 1940’s and is marked on the buzzer cover “Musonic TD MK”, the TD MK referring to Trade Mark. It consists of two Paxolin sheets sandwiching a black painted brass sheet frame where the sets wiring is housed. On the top face are mounted terminals for the battery, phones and line connections along with the key and vibrating buzzer. It could be used either as a “stand alone” practice set or as part of a two set assembly being linked through the line terminals. This example is complete although one of the terminal screws appears to be a replacement and is one of at least two variations known. One other has a lamp and switch lever giving a visual indicator as well. This was purchased in France in October 2017. 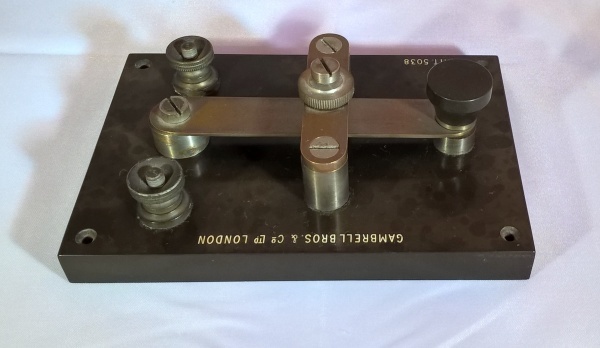 This set comprising of 2 Morse Keys, Buzzer, Bulb, Bulb Holder and Wire is complete apart from the instruction sheet and was manufactured around 1950 by J. L. Randall of Potters Bar, Middlesex under the brand of Signalling Equipment Ltd. (S.E.L.). This was one of two brands that Randall had, the other being Merit. The S.E.L. name was used mainly for scientific and educational toys where Merit was used for General Toys. J. L. Randall was established around 1944 and was based in Potters Bar until 1965 when they moved to Hertfordshire.The company florished in the 1950's and 60's and placed regular advertisments in Meccano Magazine. They were one of the main competitors to Mamod for Models of stationary steam engines of which they had 5 established models. This training key and buzzer combination could be placed in either British or German camps. The key was manufactured by the famous firm of Bing Brothers (Gebrüder Bing) which was established in Nuremberg, Germany, in 1866, as a small distribution company for kitchenware and later toys by the brothers, Ignaz and Adolf Bing. The buzzer assembly is one found commonly on training assemblies but could have been purchased separately. Bing items can be identified and dated by its trademark. Items bearing the letters "GBN" (for "Gebrüder Bing Nürnberg" — "Brothers Bing Nuremberg") in a diamond date before 1923, while items bearing a sideways "B" next to a "W" (for "Bing Works") date from 1924 to 1932. Although the key has no plate on it, two pin marks are visible where the famous trademark plate was always placed. Another example of this key can be seen under German Keys within the collection. This Submarine cable key was made by Muirhead & Co when they were in Westminster between 1894 and 1896 when they moved to Elmers End in Beckenham, Kent. It is labeled as a Saunders Signalling Key with the serial number of No 13046 and L.T.S. with a figure 7 on the front edge. This is presumed to indicate that is was in use in the London Telegraphic Station and possibly line 7. These cable keys were designed for long distance inter continental transmision work. 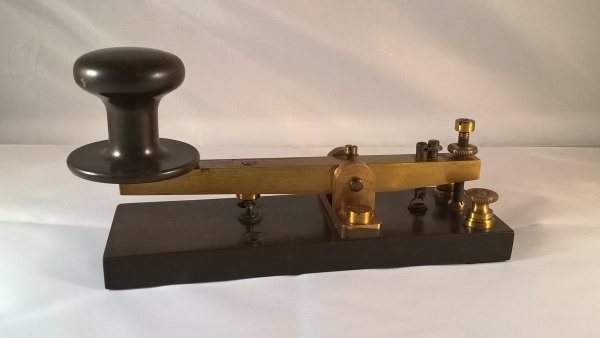 Due to the length of submarine cable and its capacity to hold a large amount of charge, the ordinary Morse method of telegraphy was not practical. 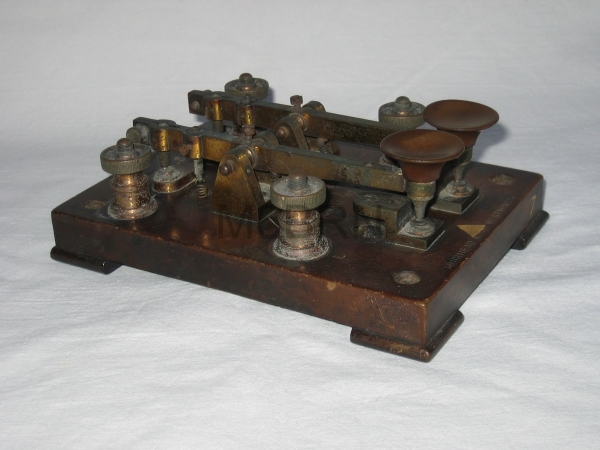 The received signals were too weak and was overcome by keying the cable with two telegraph keys on one base. When neither key is pressed down the cable is put directly to ground to drain off any residual charge. If the "dit" contact is depressed, the positive terminal of the battery is put to the cable and a positive deflection occurs at the receiver which initially was a Mirror Galvanometer in which the deflection of a spot of light from a zero point on a screen up or down meant a dot or a dash . If the "dash" contact is depressed, the negative terminal of the battery is put to the cable and a negative deflection occurs, the duration of the deflection had no importance.